How long it takes to cook a turkey depends on the oven temperature, whether the turkey is stuffed or not, how many pounds the turkey weighs, and the doneness temperature. The following Turkey Cooking Time Chart is for an oven temperature of 325 degrees F. This is the preferred temperature for cooking a turkey according to most all brand recommendations. 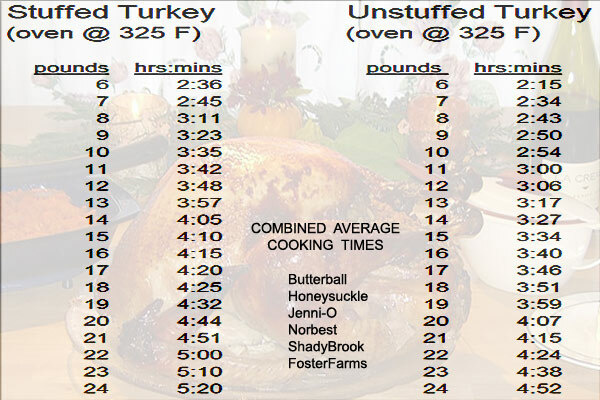 I feel that this is the best turkey cooking time chart because I have combined and extrapolated the average cooking times from Butterball, Honeysuckle, Jenni-O, Norbest, Shady Brook, and Foster Farms. I believe this will provide a more accurate average typical time that it may take to cook a turkey as cross referenced with pound weight. IMPORTANT: The only true way to determine if a turkey is safely cooked all the way through, is by measuring the internal temperature of the bird with a meat thermometer. For an accurate reading, the thermometer should be inserted into the thickest part of a thigh not touching the bone, and also check the center of the breast. Turkey is done and safe to eat when internal dark meat temperature reads 180 degrees F.
Tip: Cooking (roasting) the turkey low and slow (325-F) results in a more juicy tender bird than higher temperatures which may dry it out quicker. Oven Temperatures Vary: Be aware that there is variability in actual real world oven temperatures compared with what they’re actually set to. Some may be off by as much as 25-degrees. This will affect your turkey cooking time (either shorter or longer). Tip: Use an Oven Thermometer to verify the accuracy of your own oven. The turkey cooking time recommendations from each of the mentioned brands vary somewhat. That’s why combining them together as an average should provide you with a close approximation as to what you may expect from your own oven. How Big a Turkey Should I Get? Turkey cooking time certainly depends on how big the turkey is! How Soon Can I Carve The Turkey? Let your turkey ‘rest’ for 20 minutes before carving. How Long Does It Take To Thaw A Frozen Turkey? Rinse the turkey in cool water. In a clean container large enough to hold the turkey, mix your favorite brine recipe solution and ingredients. Submerge the turkey in the brine solution. If there is not enough brine to cover make additional brine. Cover and refrigerate 6 to 8 hours. Remove the turkey from the brine. Discard brine. Do not use brine. Pat skin and cavities dry. Roast turkey according to directions and cooking time chart. Are there any other Turkey Tips that you would like to share? LOL. You didn’t cover my 52.5 pounder!!! All good info Ken, thank you. A bird that big would be great to roast in an imu in the ground,,, kahlua turkey! Does anyone still “Roast” a turkey anymore? I do “inject” the bird with Cajun Butter mix, adds a little flavoring and keeps the Turkey a little more moist it seems. Don’t forget to use the carcass, bones, left-overs for a GREAT Soup. Yes, we still stuff And roast a Turkey, we also deep fry one and we often will babrbq one as well depending on number in attendance of our feast. This is our favorite family gathering. Since you have a bird at 52.5 lbs that leaves a lot of left overs for the family to snack on. Hope you & yours has a joyous holiday feast. Is it a little like de ganja mun? Put it in a bong! Wonder what Cheech would do? Yar Hippy days are showing…. – Actually, I use a large barrel-type smoker and about 18 hours of low heat/smoke from pre-soaked pecan or mesquite wood. I generally lose a night’s sleep getting that bird done. I hate to admit it, but I broke down and got me one of those electric smokers from Master Built. Set the temp, set the time, add wood every few hours and walk away….. I use it almost every weekend…..
– DS had one of those. His Ex took it to Pennsylvania with her, before we got to try it. No idea if she even kept it or put it in a garage sale. We do, I put it in a large electric roasting pan. The way I wrap the bird in layers of foil to seal in the moisture, it comes out tender & moist. It is almost a steam/bake process, I start it a least two hours before dinner is ready. When the bird is cooked an browned I shut off the roaster, place heavy bath towels over the cooker to keep it hot until the rest of dinner is ready. My Grand Ma always used one of those cookers, think I still have it somewhere, and the bird was ALWAYS GREAT!!!!! But I got hooked on the Deep Fried and now the Smoked T-day Turkey…. Those were the original crock pot! My mom had one of those and they are great. Funny you mentioned the roaster. I asked hubby for that for Christmas. I was watching Appalachian Homestead on YouTube last week and she was cooking down tomatoes in the roaster to prepare them for canning (it was a video from July). I thought it would be great for cooking a lot of garden produce, apples for applesauce, a ham or turkey. What else do you cook in yours? Everything I can think of which has to be processed in a baking form of cooking. I have never attempted to bake homemade bread in one I should confess, hopefully it would work as well as the house cooking stove. We go with Honeysuckles and sometimes Norbest. Tried a Butterball a few years ago and other than the price, there wasn’t any noticed difference. I’m with you, Honeysuckle is the bird. The local Safeway has them on sale for $0.49 a pound now. Of course you need to buy $20 worth of other items, but that easy as all get out now-a-days. Talking of T-Day reminds me of the “good old days” when the morning hunt with Dad and the brothers ended up entering the home with a turkey cooking, the smell was soooo goodddd., and the Pies sitting there. OMG those were the days for sure. – Last family get-together required three turkeys – one roasted, one smoked and one deep-fried Cajun style. The only one not to have any leftovers was the fried turkey. Both DD’s are already asking about fried this year, and I will probably be smoking one as well (pecan wood) when DW asks. Altogether around 35 lbs. of bird minimum. (Expecting 8 adults, two teenagers, and 6 kids LOL) Usually buy whatever is cheapest on sale at HEB or United. Ditto on the Cajun butter, usually with jalapeno or homemade, NRP. Injector gets used on both roasted and fried. The brining seems to make quite a difference, at least the two ive done were more moist and flavorful. I use my ice chest to brine my turkeys. I put the brine and bird in one if this iven cooking bags. Remove all air and tie bag. Put in ice chest and place ice bags around it and brine over night. Always works good and no clean up. I like Mary’s free range turkey. Big legs and lots of dark meat. Mmmm mmm good! I always use one of those cooking bags. It doesn’t take as long to cook, and there’s always lots of juice/broth for gravy. Every year I declare it will be my last year to cook Thanksgiving dinner, but I keep doing it – absolutely love the leftovers. I have cooked a lot of turkeys over the years (the birds that is) and the turkey cooking bag is the only way I cook them anymore. It takes much less time, the turkey is always juicy and all the juice etc, stays in the bag. If you are careful your pan is clean! yeah!!! no cleanup. I also use the 8 pound bags for ham, never overcooked always moist. (and no cleanup). I stuff a turkey between the skin and the breast meat. Keeps white meat moist while dark fully cooks and lets stuffing flavors permeate the meat. Stuffing also stays moist with juices from the skin. My Thanksgiving Turkey is going to be cooked perfect, I’m going to Golden Coral and am going to enjoy turkey and the choice of 500 other things. Gordon Ramsay would say that your turkey should rest as long as it was cooked…. I’m cooking my turkey in a Dutch oven over an outdoor fire. Good luck all on your cooking endeavors! Respectfully, The Break Away Homesteader. Do you bury the whole thing in coals? And for how long? what size turkey, what size oven? I haven’t done a turkey in my Orion smoker/steamer, but I have done everything else. This does everything in about half the time and has a very large capacity. It is currently priced around $250 but I got mine for half of that. There are lots of videos on it’s use on that video website. It is stainless steel of a hefty gauge. You can do multiple servings in it, I’ve done chicken, ribs, sausage all in one session. After T-day I’m going to pick up a bird and cook it up and freeze or can it. We have done the trash can turkey many times. Fall off the bone moist.